For you readers who are not old enough to remember “To Tell the Truth”, the quiz show from the 1960’s, the last part of that sentence would be, “Please Stand Up”. Then the panel would find out if they had guessed correctly the real whoever after quizzing three guests, two of whom were imposters. If one of the imposters had succeeded in fooling the panel he was rewarded. In this case we know that Maplewood’s James C. Sutton will not be standing up anytime soon. But he may be rolling over in response to some of the comments that have been appearing here lately. 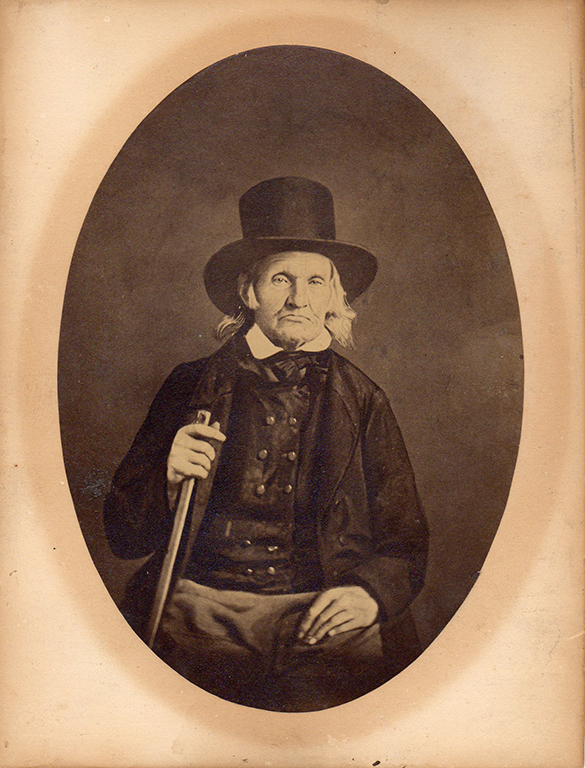 The Sutton family legend identifies an image of a gentleman in a top hat as James C. Sutton. 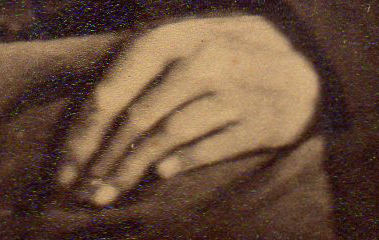 Nowhere on the photograph, the mount or frame is he identified. 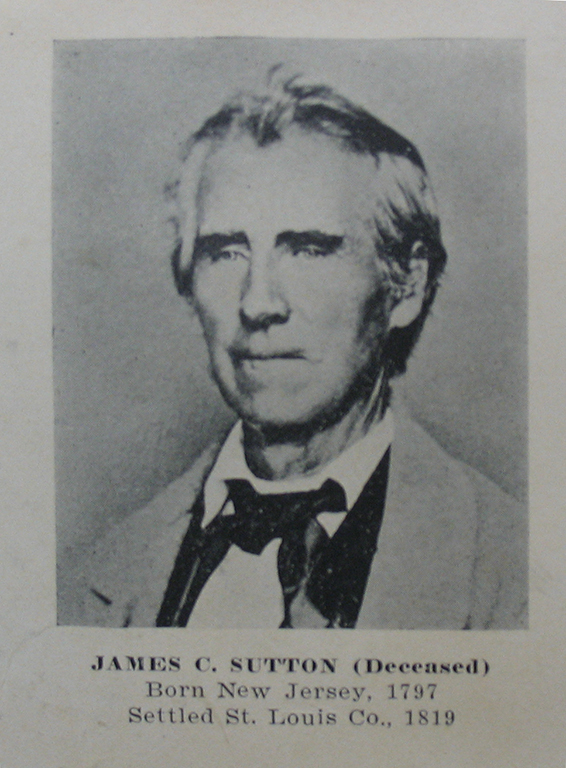 The other photograph of James C. Sutton is positively identified. It appears in the rear of the 1909 Plat Book of St. Louis County. In my retirement I have taken seven full semester college courses in figure and portrait drawing, painting and sculpture. Comparing the two photographs side by side, my feeling is that they are not of the same man. The man in the top hat has rounded eyebrows compared to James’ flatter ones. Top hat’s eyes show more of the lower lid than James do. The cheeks are different. The mouths are very different. Something else to consider is whether or not the image of Top Hat might possibly be a photograph of a painting. I have looked at it closely and I really can’t say for sure. Some parts of it definitely look like they have been painted. 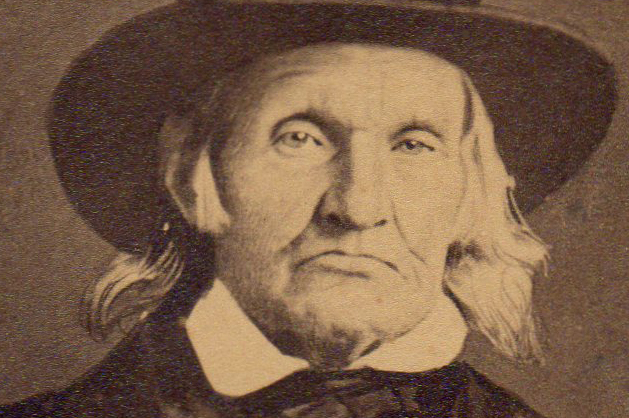 His hair and the right side (on our left) of his face seem to have been painted. So does his unusual looking left hand. Hands and feet are bugaboos to figure painters and sculptors. They are so hard to make look right that many artists simply leave them out or only show very little of them. The problem with man in the top hat’s left hand is that his little finger seems too short. This sort of mistake is so common that if this were the only part of the image I could see, I’d say this was definitely a painting. Is it a painter’s mistake or family genetics? It is also common for figure painters to leave the backgrounds almost featureless. It’s understandable. It is much less work. A photographer with no extra effort can include anything he or the subject desires. It is much easier to put an actual curtain in the background than to paint something that looks like one. But while many figure painters wouldn’t have any recognizable items in the background they still might have simple changes in the light or readily identifiable brushstrokes. The resolution of the original image doesn’t allow me to make out any brushstrokes but the slight glow to make his hat stand out from the background as well as the one behind his right elbow are details a painter might add. Then again they could just be a light. There is also the possibility that this is a photograph that has been partly enhanced by an artist painting on it. This is an excerpt from “Shoot, Print, Paint: The Photograph as Canvas” which ran in The Epoch Times, Aug. 9, 2015, by Christine Lin. “Alternative photographic techniques” is a catch-all term to describe a variety of processes that can be done to a photographic print. These include bromoil, hand coloring, hand tinting, and toning photographs. 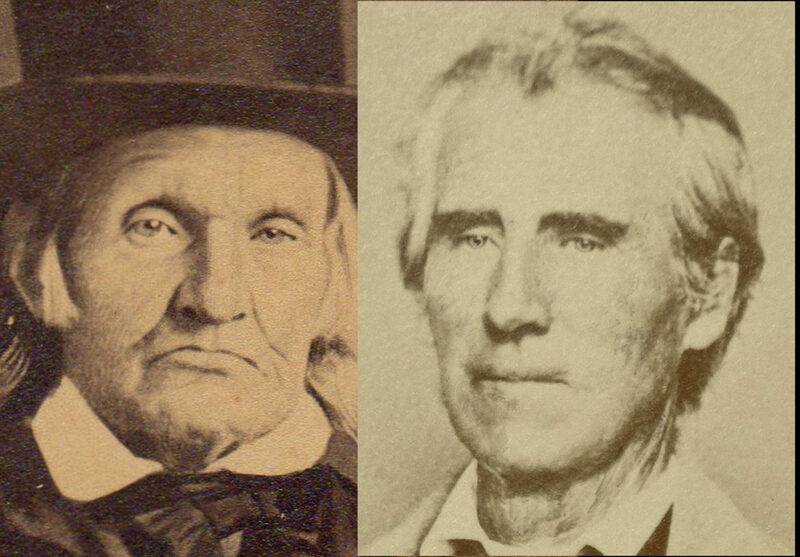 These techniques have roots in the early days of photography and were used to enhance photo portraits. Specifically, photo oils were developed to add a flush to the cheek, smoothness to hair, or to minimize the appearance of blemishes. With the advent of color photography, the need for hand coloring diminished, and it evolved into an art form. When I look at the whole image of Top Hat, I have the feeling that it is a photograph. His clothing would be fairly complicated to paint. The way the light falls on it all looks correct to me…like a photograph. Also his tie is crooked. Just the way an old man might put one on. Wouldn’t a painter have straightened out his tie? Many of the paintings of our ancestors only include the subjects head and shoulders and maybe a bit of their chest. It’s just easier, faster and probably cheaper than including much more of their bodies and dress. Of course, one can find exceptions to every rule. My feeling about the Sutton family descendants image of the man in the top hat is that it is a photograph, it is not James C. Sutton and it may have been altered a little by an artist with oil paints. 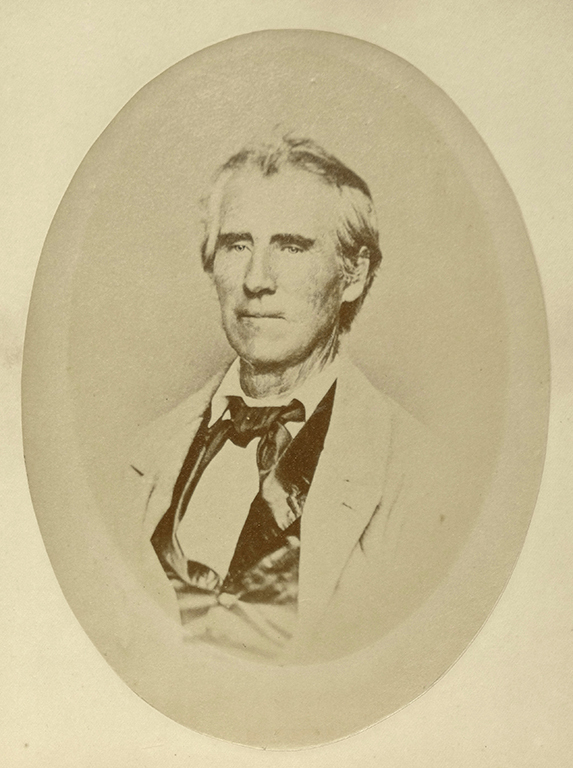 This is an original photograph of James C. Sutton from the collection of the Sutton family descendants. Here is how we know that for sure. From the 1909 Plat Book of St. Louis County. According to the Sutton family legend this image of a man in a top hat is also thought to be of James C. Sutton. I don’t think that it is. I have removed this photograph from its frame and examined it carefully. Nowhere on the photograph, mount or frame is the man identified. As I said above: The man in the top hat has rounded eyebrows compared to James’ flatter ones. Top hat’s eyes show more of the lower lid than James do. The cheeks are different. The mouths are very different. Even though I’m fairly certain that we’re looking at a photograph of a live subject and not a photograph of a painting some parts of this image definitely look as though they have been painted. The lower right side (on our left) of his face and his hair look more like the work of a painter. His left hand looks awkward. From above: Hands and feet are bugaboos to figure painters and sculptors. They are so hard to make look right that many artists simply leave them out or only show very little of them. The problem with man in the top hat’s left hand is that his little finger seems too short. This sort of mistake is so common that if this were the only part of the image I could see, I’d say this was definitely a painting. Is it a painter’s mistake or family genetics? 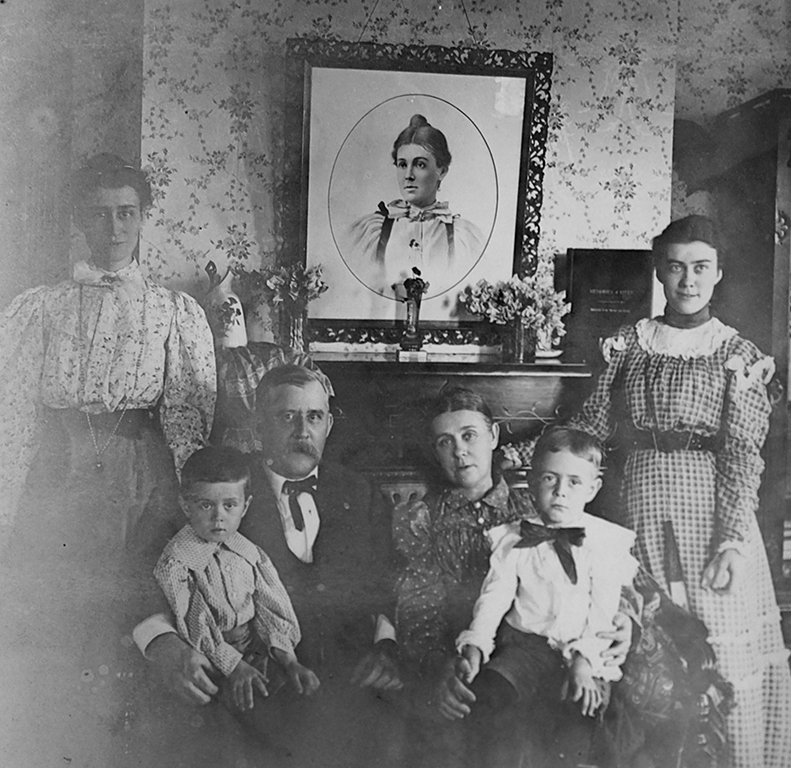 Notice the ancestor portrait painting hanging over the mantel in this photograph of the William L. Thomas family. It seems to be fairly typical in that there is nothing in the background and only the head, shoulders and part of the chest are visible. Much thanks again to the descendants of the Sutton and the Thomas families for sharing their superb collection of artifacts with us. There is much more to come. I wonder if we could figure something out based on their clothing. I have researched a fair bit about men’s fashion; albeit not much before 1920. Some real Victorian Era clothing geeks could probably date the photos based on what the men are wearing. As a cello teacher, I see a lot of variation in the little finger. I’ve seen pinkies that short in some of my students — maybe less common but I’ve seen it. Mine is longer than most people’s. A short pinkie can be problematic when playing the cello, but not impossible. I think that pinkie is not that much out of the ordinary. Looking at the two photos, I agree that they aren’t the same person. However, I think the man with the hat is older, but even with aging I don’t think he is the same. Maybe he is another family member? Unidentified or poorly identified photos is a problem in my family, such as a tintype labeled “Grandma Lee’s mother” (which generation of Grandma Lee?) or “Uncle John’s Grandson” (which Uncle John?) on a cabinet card. Style of photo helps date it to a certain era. My wife has a mortuary photo from about 110 years ago–I think that is what it’s called. Photo of a deceased child who died in a fire (her grandmaw’s very young brother). The family had no photo of him living so one was taken of him dead but painted to look alive. I think his fingers were badly burned: they were drawn and I think poorly done. That family was short on money so maybe corners were cut. It’s the only childhood portrait photo of any of the siblings in that family. Hi Doug, compare the tips of each of the fellows’ noses. Gary, James seems to have an indentation on the bottom left side of his nose. Is that what you’re noticing?